Ravangla to khechuperi trekking known as Rabongla to khechuperi lake trek. Ravangla (2440m) is also known as Rabongla. It is located on the ridge separating the Teesta valley from the Rangit valley Ravangla is South Sikkim’s latest tourist attraction. Obviously the prime attraction of Ravangla is the unobstructed views of the snow peaks. Ravangla offers breath taking views of Kanchanjungha along with its sister peaks of Pandim, Kabru, Sinialchu and many others. Ravangla is located at the foot of Menam hill, housing a small hermitage. Ravangla and Khechuperi combination create nice trekking route in Sikkim. 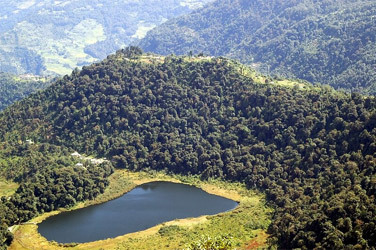 Khechuperi is one of the scared lake of this state, The lake remains hidden in the rich forest cover. It is believe that bird do not permit even a single leaf to float on the lake surface. This mysteriously wishes fulfilling lake. Day 01: Pick up Bagdogra airport, drive Gangtok,4-5 hours, 125kms. Day 02: City tour including Rumtek Monastery, Tibetology, Chorten, Enchey etc. Day 03: Gangtok drive Rabangla (2100 Meters) via Temi Tea Garden and Samdruptse 4-5 hours. Day 06: Hongri Monastery trek to Yuksom for about 3-4 hours, 9kms. Day 07: Yuksom trek to Khechuperi, 12kms, 5 hours. Day 09: Pemayangtse Drive Darjeeling, later half city tour. Day 10: Early morning visit Tiger hill. Day 11: Darjeeling drive back to Bagdogra Airport.